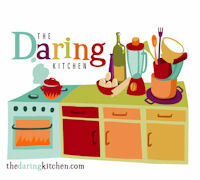 For January's Daring Bakers' challenge, hostesses Karen (aka Baking Soda) of Bake My Day! and Zorra of 1x umruehren bitte inspired us to do something light. And what could be lighter than tuiles? Tuiles are wafer thin butter cookies. Our only requirements for this challenge were to make at least one of the tuile recipes they provided us (vanilla, chocolate, nougatine, or savory), shape it any way we like and pair our tuiles with something light and refreshing. Tuiles are traditionally molded over a rolling pin while still hot from the oven to create an arched shape that resembles curved French roof tiles hence the name "tuile". The key to making tuiles is spreading the batter just right. It shouldn't be too thick or too thin. Too thick and they will bake up chewy. Delicious but chewy. Too thin and they will be too brittle to shape or not sturdy enough to be used as a vessel (like a bowl or cone/cornet). But I would err on the side of too thin because I prefer a light, almost see through quality, especially if I'm shaping the tuiles the traditional way. To create 4-inch round tuiles, I cut a paper plate to make a template. Getting the thickness correct took some trial and error. My first 2 batches were too thick and my next two batches were too thin. Even though I eventually got the desired thickness, I still couldn't shape my tuiles into small bowls like I wanted. So I ended up with shallow ruffled wafers. They were still quite pretty but not what I originally planned. I wanted to pair my tuiles with a fruit sorbet but I didn't have time to make my own sorbet. Instead, I topped my tuiles with a few frozen raspberries and I dusted them with just a bit of powdered sugar. When the raspberries thaw just a little bit, they taste just like sorbet. It was a perfect accompaniment to the tuiles. Line a baking sheet with parchment paper or grease with either butter/spray and chill in the fridge for at least 15 minutes. This will help spread the batter more easily if using a stencil/cardboard template such as the butterfly. Press the stencil on the baking sheet and use an off sided spatula to spread batter. Leave some room in between your shapes. Mix a small part of the batter with the cocoa and a few drops of warm water until evenly colored. Use this colored batter in a paper piping bag and proceed to pipe decorations on the wings and body of the butterfly. Bake butterflies in a preheated oven (180C/350F) for about 5-10 minutes or until the edges turn golden brown. 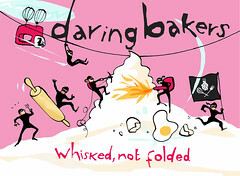 Immediately release from baking sheet and proceed to shape/bend the cookies in the desired shape. These cookies have to be shaped when still warm, you might want to bake a small amount at a time or maybe put them in the oven to warm them up again. (Haven’t tried that). Or: place a baking sheet toward the front of the warm oven, leaving the door half open. The warmth will keep the cookies malleable. Your Tuiles look great and pretty! Very well done, once again! Beautiful stacks of tuiles, top with berries... superb! Good job on this month challenge. Instant sorbet, nothing beats raspberries! These look so light and elegant, perfect! they look nice toppied with the berries....cheers! how perfect they look mary! great going! Great job on your challenge and I love the pic with the raspberries. Pretty! That is similar to what I had been aiming for with mine. Truly in keeping with the "light" theme. I just love the second picture. Its beautiful. They look so dainty and beautiful! Simple, light and elegant. Beautiful topped with fresh raspberries! Mmmmm, so pretty! I had trouble getting my tuiles thin enough, but I will have to give it another try...yours are lovely! Love that top pic - it really highlights the appeal of tuiles: light, crispy goodenss! I love the raspberries! very clever! And the tuile looks so delicately ruffled---so pretty! SO light and pretty! I love frozen raspberries...they really do have a great texture. You did a wonderful job, this looks beautiful. 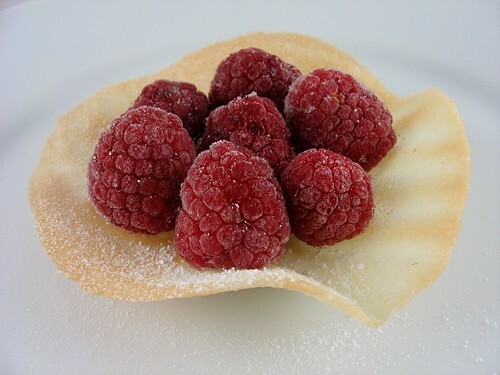 Your tuiles look beautiful topped with the raspberries! nicely done! Great job! Your tuiles look lovely! Oh, Mary! They're so light and pretty. Love them! So pretty with the little sugared raspberries cupped in a nice crispy tuile. That is a simple and beautiful shape. Frozen raspberries are delicious. Beautiful job! I love the simplicity and beauty of topping them with raspberries. that looks beautiful. raspberries would be a perfect accompaniment. Yum! I like that the tuiles aren't exactly uniform in shape. It truly gives them character! Love the frozen raspberry pairing. So beautiful! What a lovely post I just love the tuiles that you created. Simple is best with these "cookies" the crisp crunch and the sweet berries would of be heaven. As always love your postings. 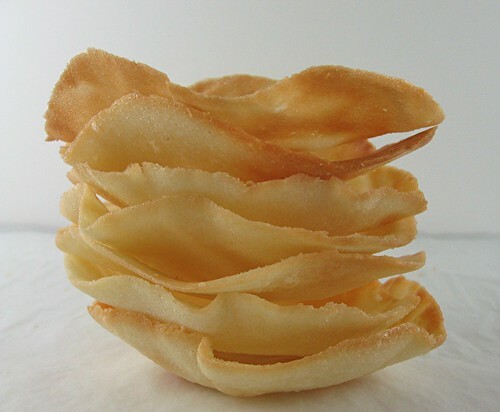 Tuiles are capriccioso, but you handle it well! Simply pretty, I love it. Beautiful job! I had the same problem shaping my tuiles, Mary, but as usual yours are so lovely! This tuiles looks so tasteful!! The raspberry over makes the pic perfect! Now that is one beautiful fruity and light tuiles. That is simply brilliant Mary. that looks lovely...of course, i would like to have it with vanilla ice cream!